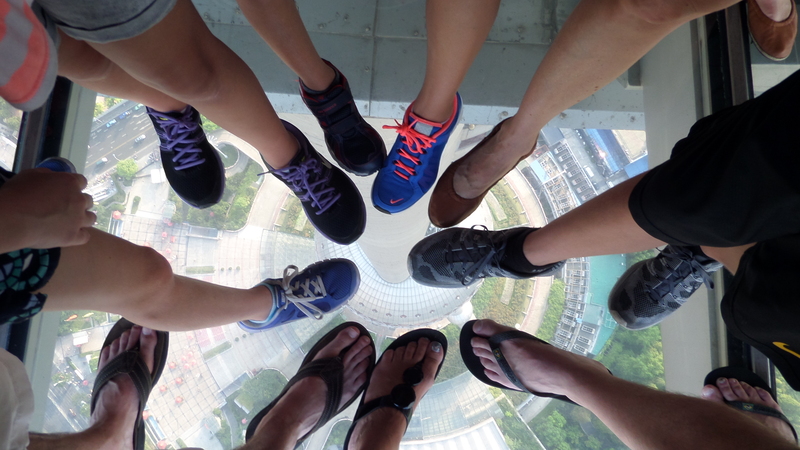 Yesterday we went to the Oriental Pearl Tower with our new friends. The Chinese name is Dōngfāng Míngzhūtǎ. It was completed in 1994 and stands 468.0 meters tall (1,535 feet). There are 14 floors and 6 elevators. And half a million people waiting in line to ascend. It is located in Lujiazui in Pudong on the east bank of the Huangpu River. 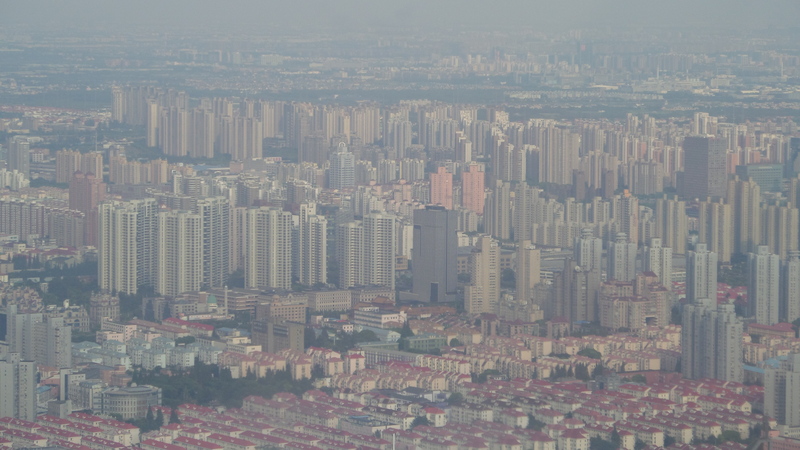 The Pearl Tower was the tallest structure in China until 2007 when the Shanghai World Financial Center looked down at it from a height of 492 meters (1,614 feet). Then, in a display of “mine is bigger than yours” the Canton Tower in Guangzhou arrived on the scene with a height of 600 meters (1,968 feet). 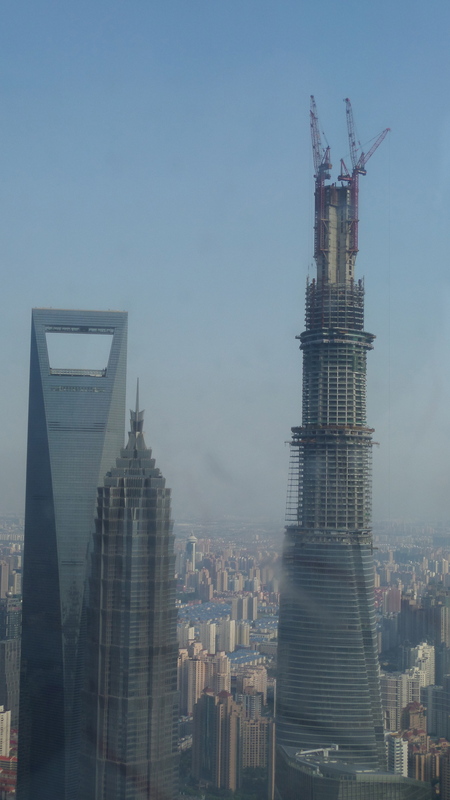 Not to be out done, Shanghai has come back with the Shanghai Tower with its height of 632 meters (2,073 feet) – taller than the Burj Kalifa in Dubai. But wait, the battle does not end here. The Sky City One, under construction in Changsha, will be 838 meters tall (2,749 feet) – give or take a meter. Why? Why not! Anyway, back to the Pearl Tower. It has 3 balls. I’m serious. When you purchase tickets you must specify how many balls you want to visit. The biggest ball (at 90m-295 feet) contains a roller coaster, observation deck and some kind of arcade. 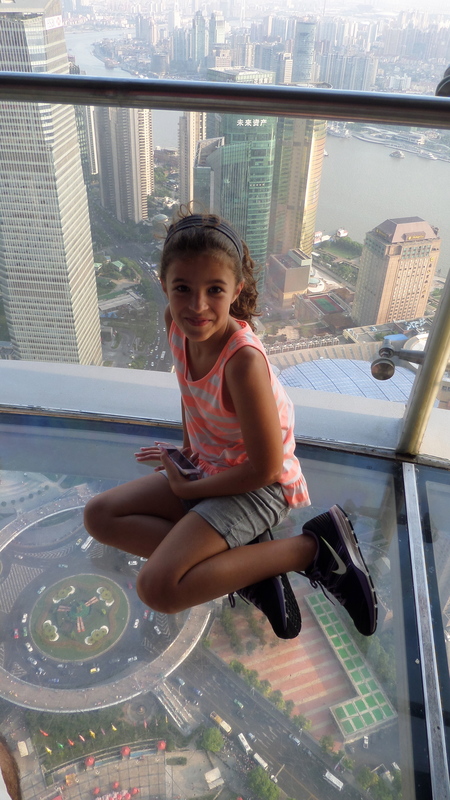 The middle ball (at 263m – 862 feet) has the transparent glass floor – AMAZING! 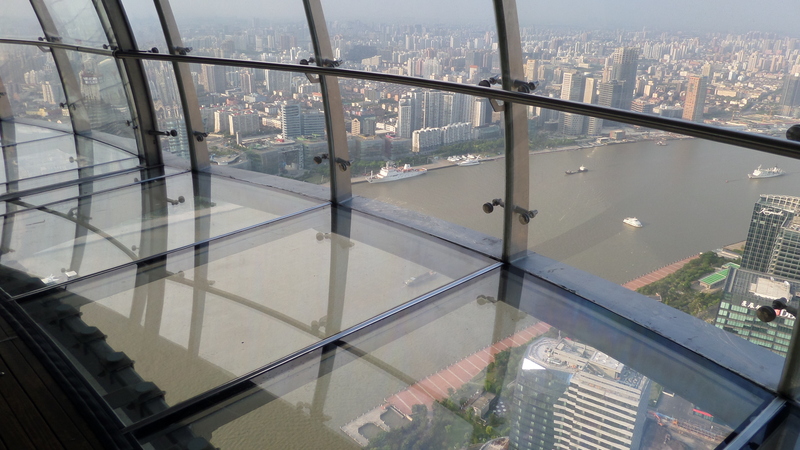 The smallest ball at the top (at 350m -1,148 feet) has the Space Capsule observation deck. Amazing views. There is also a revolving restaurant and a small hotel. The Shanghai History Museum can be found in the basement level and was a wonderful exhibition of early life in Shanghai. We really enjoyed it. 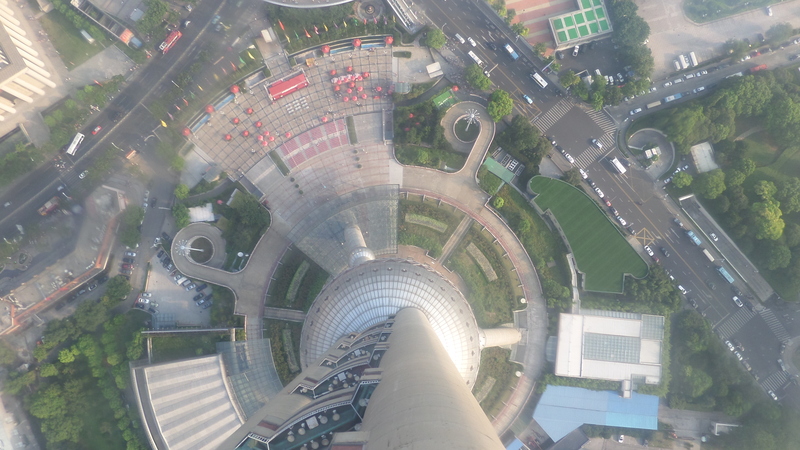 Visiting the Pearl Tower’s three balls will set you back $220RMB per person. ($35US) It was well worth the visit. We enjoyed being tourists in our own city – not sure how long we can do that before we become Shanghai-ed and too cool to do these “laowai” (foreigner) activities! Thanks, Tammy, but I need some photography tips. Maybe next summer I can come to Orlando? Wow, Amazing pictures! 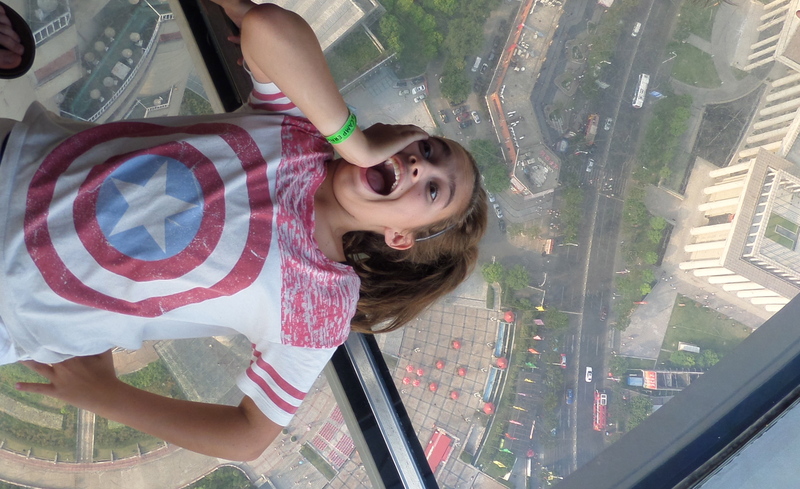 Nice that everyone was able to be daredevils and stand out over all of Shanghai. You are all very brave! Not brave, insane. Love you!